THREE BEARS CHALET is a brand new, truly 100% ski-in/ski-out home in the prestigious Sundance Drive location. Accessible from the Rambler Trail and Three Bears Trail.  Close to Tube Park - great for kids! 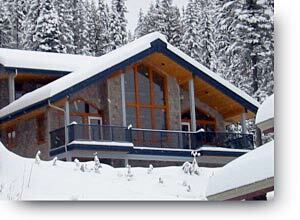 Make your Three Bears Chalet reservation in Sun Peaks, B.C. Canada TODAY! Winter view from the front of the Chalet.